Beat the yolks with sugar until pale, light and fluffy. Beat the whites until you have stiff peaks. Combine the yolks with baking powder and nuts. Mix in about ⅓ of the egg whites to lighten (the sacrifice! ), and carefully fold in the rest. Turn into a baking sheet that you have lined with parchment paper. Avoid using wax paper as it may stick! Bake at 350°F for about 15 – 20 minutes. Viola! While the cake bakes, whip the cream. Whip heavy cream until it has a thick consistency, and then whip in the raspberries and powdered sugar to taste. Cool the cake, and then dump out onto a new sheet of parchment sprinkles with powdered sugar. Spread the whip cream evenly over the cake, and roll, roll, roll! 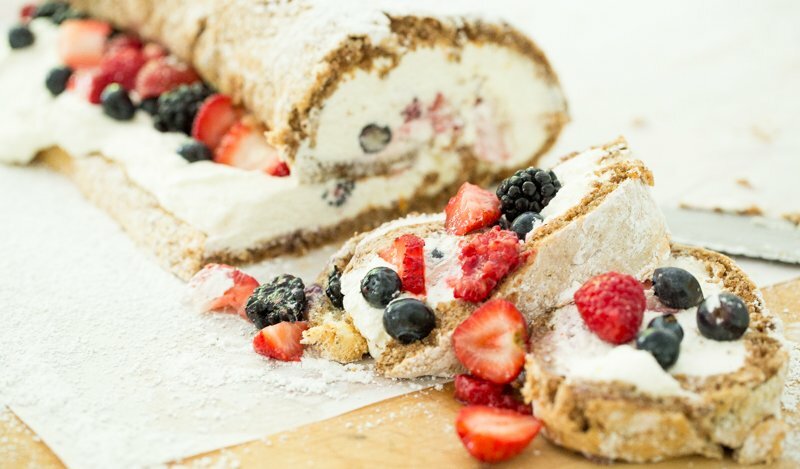 Don’t worry if your cake cracks a bit as you roll it, because an extra dusting of powdered sugar, or an extra covering of whipped cream will fix everything! The variations on this fantastic dessert are truly endless. For Thanksgiving, make a pumpkin nut roll (adding ½ a tin of pumpkin to the cake batter) and roll with a cream cheese, cognac and cream filling. Dust with cinnamon and powder sugar. It is outstanding! Also consider making versions with chocolate and mocha cream. Go on, you are the Hipcook!